and elements defined in the HTML 5 draft specification, with a goal to offer video and audio playback without being encumbered by patent issues associated with most plugin and codec technologies. Codecs for Theora video, Vorbis audio and the Ogg container are built in. As originally recommended by HTML 5 (see Ogg controversy), this codec combination for supporting the audio and video elements are also working in test versions of the Opera and Chrome browsers, see Theora#Playback. Cross-site XMLHttpRequests (XHR), which can allow for more powerful web applications and an easier way to implement mashups, are also implemented in 3.5. A new global JSON object contains native functions to serialize and deserialize JSON objects, as specified by the ECMAScript 3.1 draft, and CSS 3 selector support has been added. Multi-touch support was also added to the release, including gesture support like pinching for zooming and swiping for back and forward. 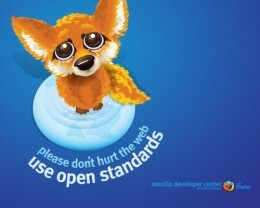 Firefox 3.5 also features an updated logo from the previous releases. A minor change for Version 3.5 is the default search engine in Russian language builds, which uses the search engine Yandex rather than Google, after a survey of Russian Firefox users indicated they preferred Yandex. The first update, 3.5.1, was released on July 16, 2009. It solved some vulnerabilities detected after the final release. Another update, 3.5.2, was released on August 3, 2009, followed by version 3.5.3 on September 9, 2009. Starting July 14, 2009, the upgrade to 3.5 was offered to users of Firefox 3.0 through the automatic internal "push" update mechanism.